Sometimes people have great ideas for apps, but just don’t have the developing skills to create them. Well in conjunction with the launch of their first phone to use the Google Android operating system, Samsung are launching an app idea competition. All you need to do is think of an idea and submit it to their website, skipping out all the tedious developing aspect.The winning app idea will get made..
My ideal app? currently that would be something that let me turn a desk and a wall into a keyboard and screen so I didn’t have to drag my laptop around with me everywhere. Okay, you’d need to invent a projector accessory to do that too. And it would have to sync remotely with my computer too. And probably have a spare battery. And order coffee? 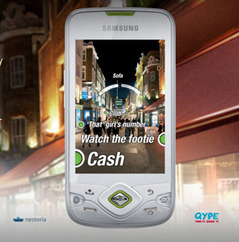 If you want to enter send in your idea via the website http://www.galaxyportal.co.uk/. The idea that gets the most votes gets made and will be available for everyone to download from Android Marketplace for free. As well as seeing their idea become a reality – the winner also gets £2,000. An EYBAIM app. or otherwise known as “Empty Your Bank Accounts Into Mine” app. How about a “Wipe your iPhone’s memory clean” app?